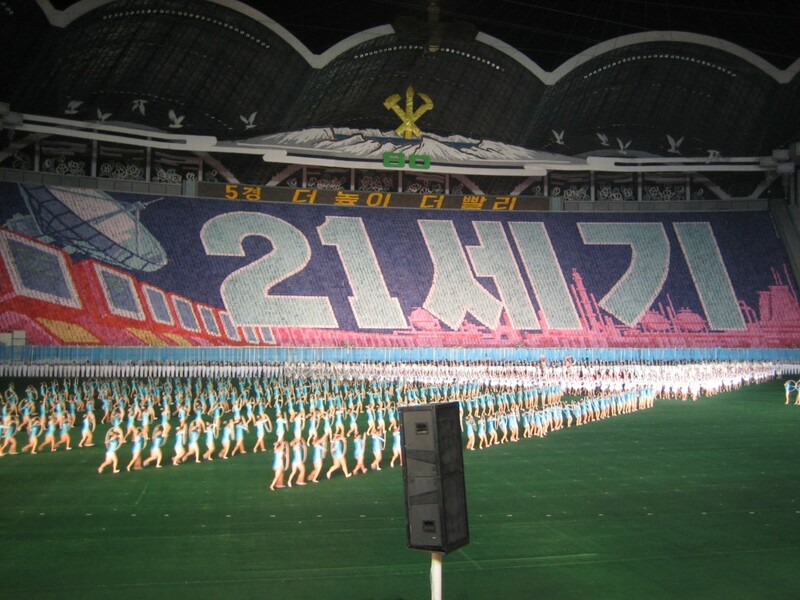 When our bus pulled up to the Rungrado May Day Stadium, we could see thousands of North Koreans milling around outside, but when we got out of the bus they all looked away, and were clearly uncomfortable seeing us there. We were escorted in by our guides, and seated together in one big block. No telling what might have actually happened had some of us chosen the upgraded seating, but that’s how it was. We were maybe 15-20 rows off the infield of the stadium, which was absolutely massive. 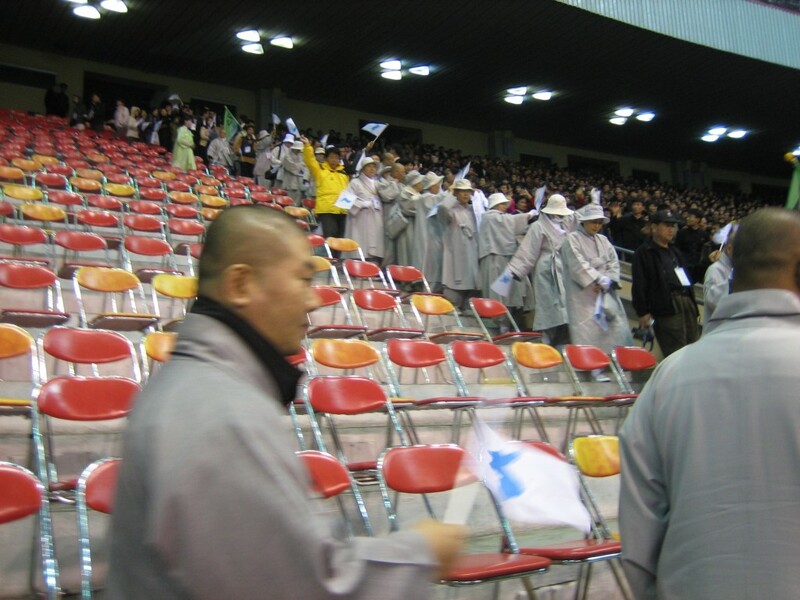 The stadium is said to seat up to 150,000 people, and it looked like absolutely every seat was packed this evening. 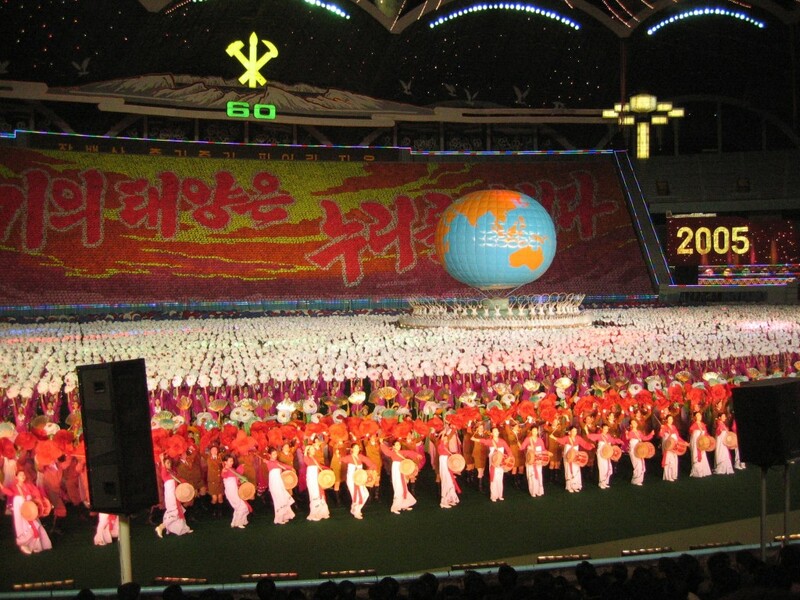 The Arirang Mass Games aka the Arirang Festival began in 2002 and has its roots in an old Korean folk story about lovers who were torn apart. A little bit of Romeo and Juliet, complete with the tragedy, but a LOT of analogy about the two Koreans being torn apart. A big theme of the performance was to build up to the eventual and inevitable reunification of lost lovers. The guide said they announced that there was a group of Americans visiting, but based on the complete lack of reaction from the crowd I doubt it was really announced. Based on propaganda that is spewed by the government, I’m not sure that would have been a safe thing to do anyways. 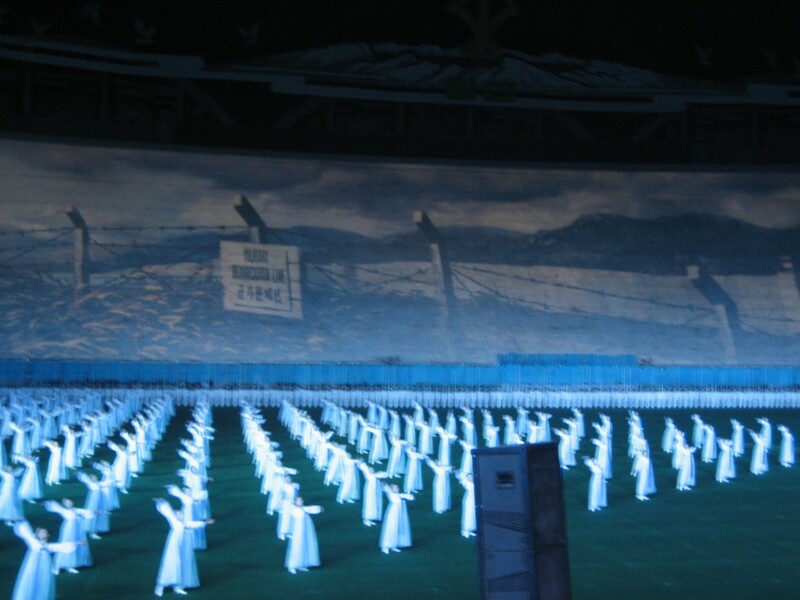 However, there was a group of around 100 South Koreans sitting behind us, all in identical grey jumpsuits, there to be reunited with family as a gesture of friendship between the warring countries. Our guide claimed the jumpsuits were because they did not want to flaunt their western lifestyles in front of their relatives, but another guy staying in our hotel who’d been living in the country for a few years later told us it was so they would be easier to tell apart from North Koreans should they escape and roam the city. Americans blending in? 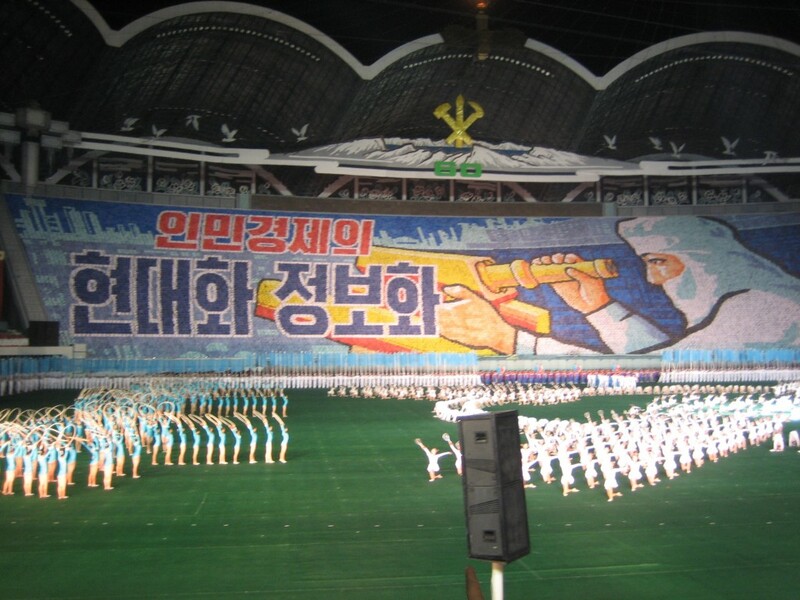 Not so much…but it would be possible for a South Korean possibly. 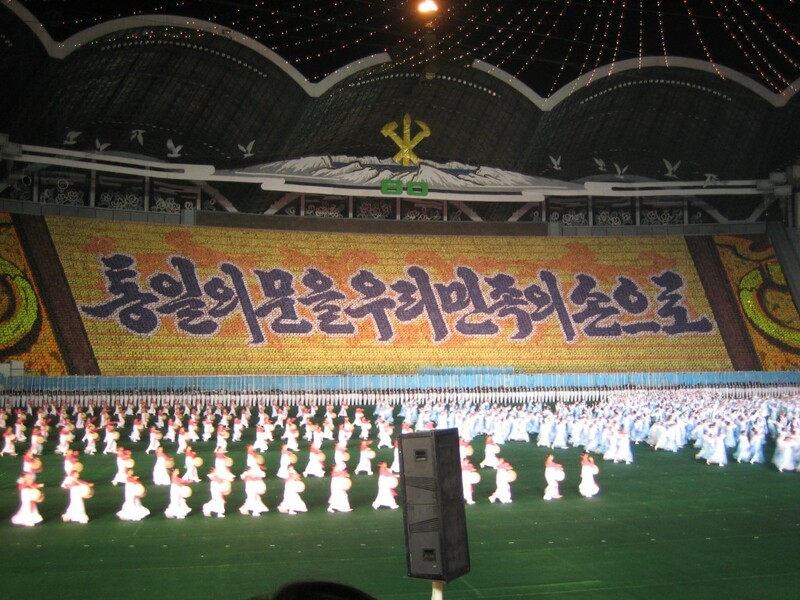 The event lasted several hours, and was an amazing spectacle of choreography that would seem impossible in the west. Unfortunately we were totally jetlegged and probably didn’t fully appreciate it, but several pictures from the event with a little commentary. 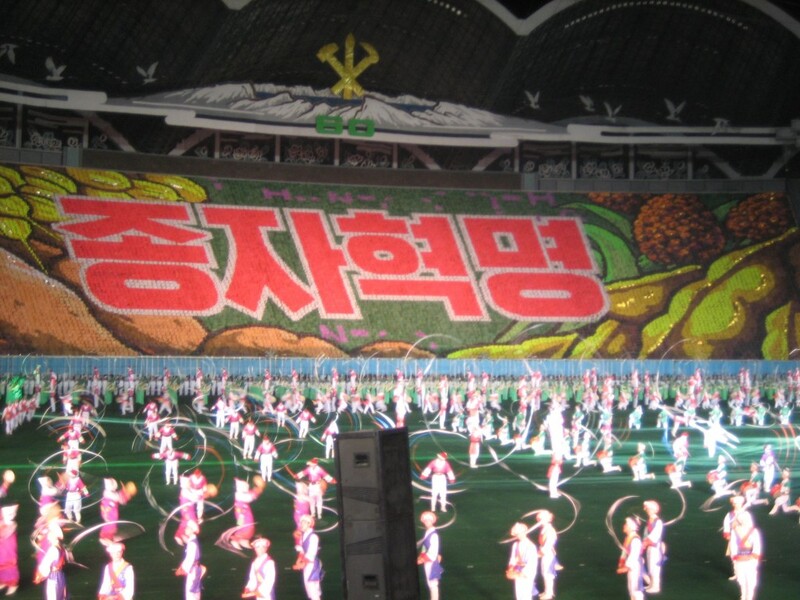 The picture in the background is 30,000+ schoolchildren who would frequently “snap” posterboards to change the background picture. This is on top of the thousands of performers. 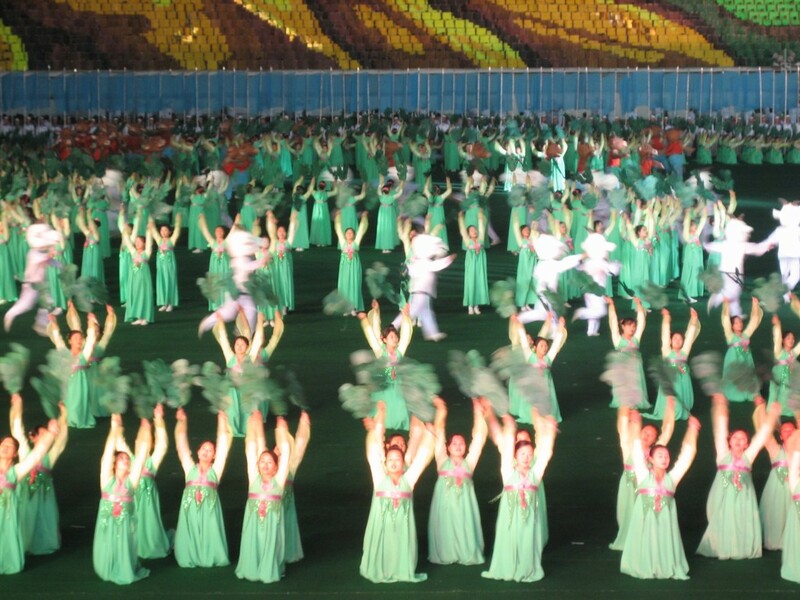 North Korea, land of science and technology. 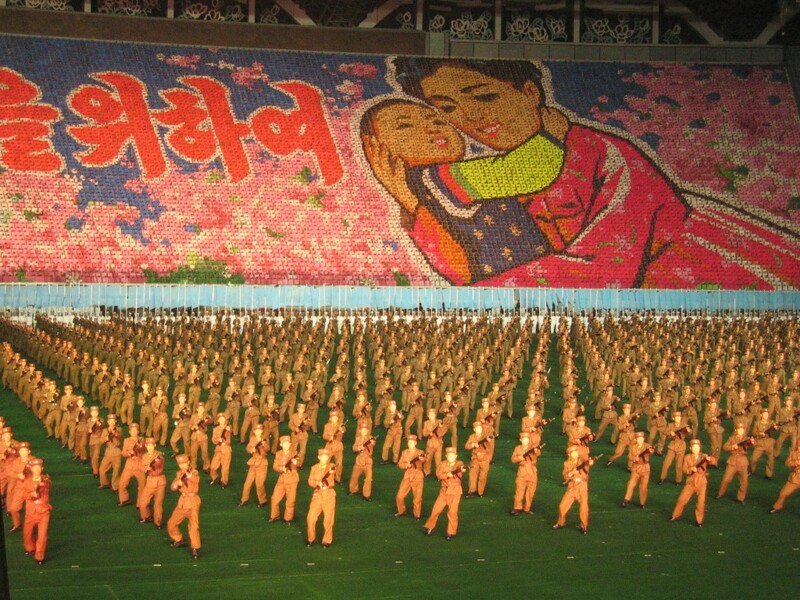 After all, as Kim Jong Un recently said, they’ve cured HIV/AIDS, Ebola, and a multitude of other horrible diseases! 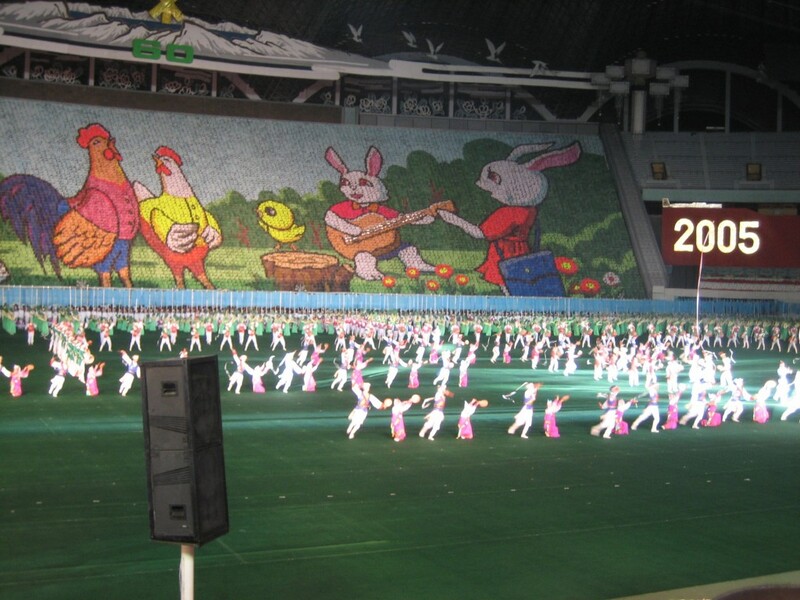 The bizarre rabbit and chicken act…. 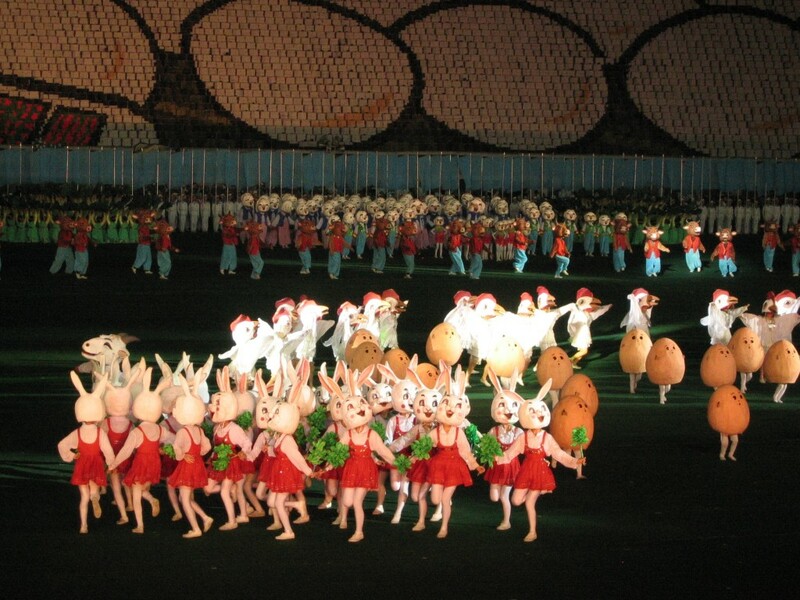 …and here come the bunnies to join the parade! 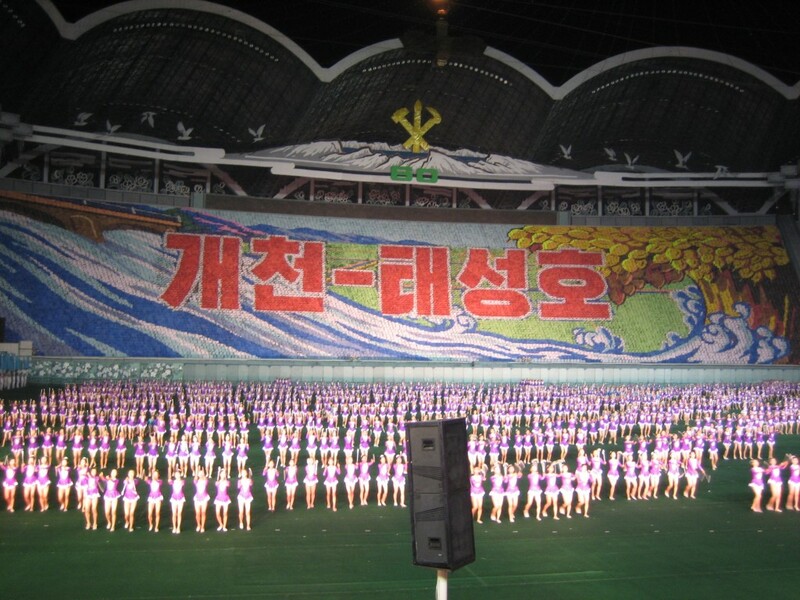 …and a mass dance number to close out the show, celebrating the eventual reunification. 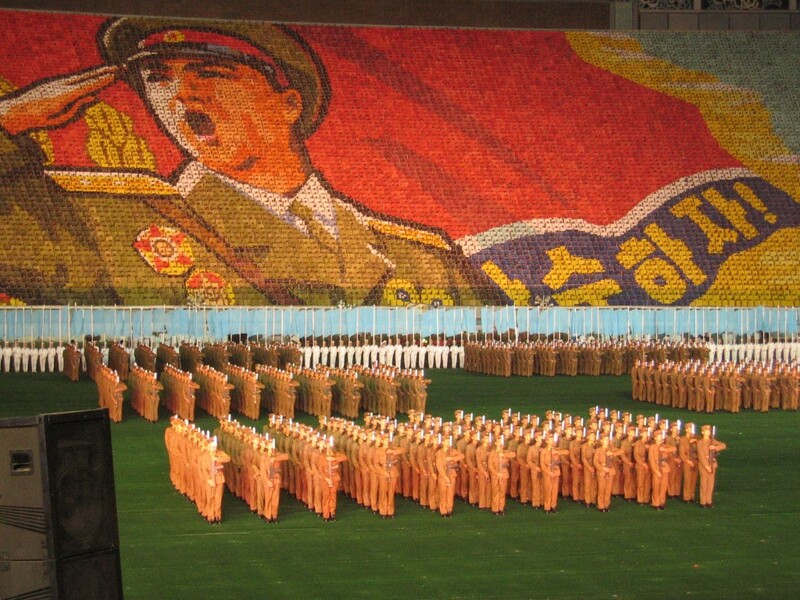 As I mentioned, I’m sure there was tons of symbolism that was lost on us, because if you looked back at the South Koreans behind us there wasn’t a dry eye in the place. It was actually super moving to see, and really gave us a real human insight into the country on our first day there. 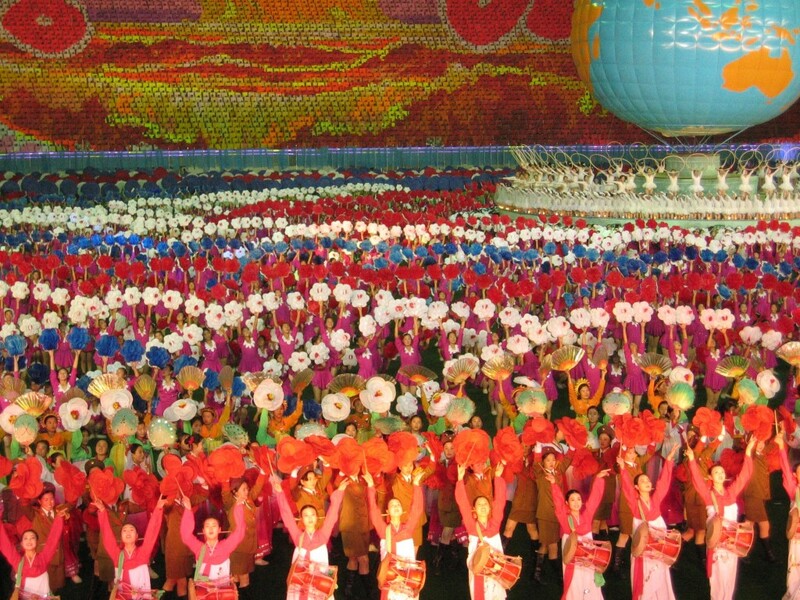 So was North Korea a paradise that’s just misunderstood? 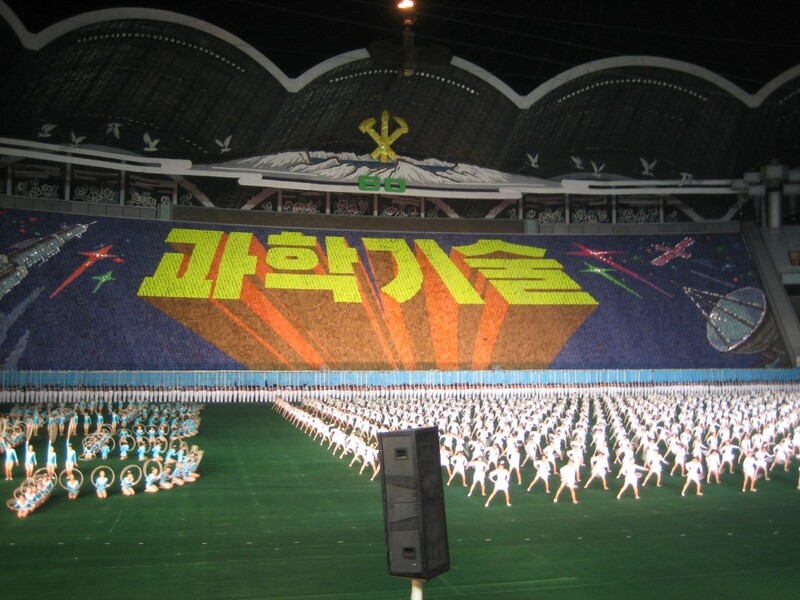 Well, the choreography was super impressed, but there’s also been plenty of rumours of performers being executed for screwing up during performances over the years. 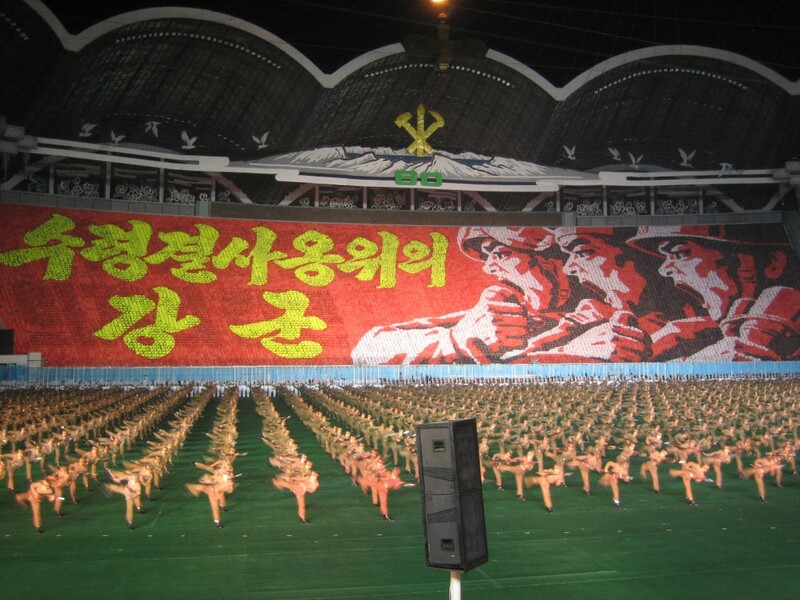 Yes, the precision was out of this world and unlike anything I’ve ever seen, but such things are much easier to achieve in a totalitarian state where the state controls propaganda and the average citizen has some level of fear. To this day, it was definitely most unique performance I’ve ever seen anywhere in the world, and I can’t imagine anything else remotely like it. Imagine training 50,000 or more performers to do a show, night after night, running for weeks on end, every year. 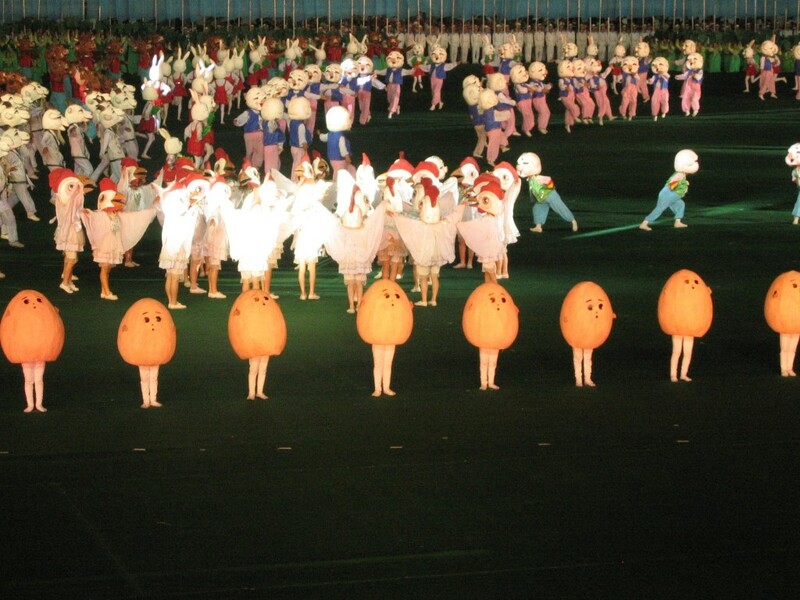 Many people perform in the show for years and years, and although the event hasn’t been held the last three years, there’s no telling if it will ever come back. We were hurried into the bus, and drove back to our hotel through the pitch black night where I promptly passed out the minute my head hit the pillow.